Charlie's Crusaders is a 100% volunteer, non-profit organization dedicated to rescuing dogs that are abandoned, homeless, neglected, or who have been passed by time and again, living months, and sometimes even years in a shelter. We strive to help dogs be adopted up North in the PA/NJ/MD/DE/CT/NY area. In addition to adoption services, Charlie's Crusaders serves to assist local law enforcement, shelters, and individuals in the Mississippi region find medical care, foster homes, and ultimately loving forever homes for the animals they work hard to rescue and protect. Even Superman had foster parents. PLEASE opt to foster. Charlie's Crusaders main focus is to build our foster program, recruit support in fundraising efforts, and just ask everyone to spread the word about our adoptable pets so they can find the forever homes and we can rescue another worthy soul. Your support matters. 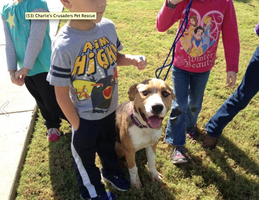 To find out more ways to support Charlie's Crusaders, check out our Ways to Help page!